One of the most ambitious life science projects was launched 25 years ago. During the 13 years it took to complete the Human Genome Project (HGP), tantalizing gene sequences displaying homology with known drug targets became evident. Genomic companies sprang up in an effort to commercialize these putative sequences, but many of these companies gave little thought to validating these targets in any disease indication. During this period, drug discovery was dominated by reverse pharmacology, or target-based screening. This discovery mode relies on high-throughput tests to evaluate millions of compounds for their ability to bind purified drug targets. By the time the HGP was completed in 2003, screening with purified protein targets was becoming less fashionable in the face of mounting attrition rates from clinical trials. The troublingly high frequency of efficacy issues suggested that screening purified protein without its biological context could be problematic. Nowhere was this more apparent than in oncology drug development. In fact, attrition rates for oncology drugs are still conspicuously high compared with the rates for most other drugs. Early attempts to remedy this situation reflected a tendency to cling to the precepts of reverse pharmacology and huge screening campaigns. Cells replaced purified protein assays, and putative drug targets were overexpressed in model cell lines (such as CHO and HEK-293 cell lines) that were easy to culture and therefore scale up for screening campaigns. Yet these approaches, too, had limited improvements in the physiological relevance to the model system used. While overexpression of drug target served to provide needed assay performance in screening campaigns, often the cell’s signaling pathways were not linked to the high copy number of the protein target. Furthermore, cells typically came from nonhuman organisms, or from tissues other than the one in which the disease of interest usually manifested. A significant step forward in building physiological relevance into cellular models of disease for drug discovery came from the use of primary cells, which provided endogenous expression of the target of interest. This was particularly so when the primary cells were from tissues that typically reflect the disease, such as the use of primary cardiac fibroblasts in the cardiovascular therapeutic area. The principal issue for this approach is supply. Depending on the cells desired, it may require organ donor provision. Once harvested, culture of primary cells is problematic, and passage numbers are limited before the cells in culture enter senescence. Thus screening campaigns need to be much smaller, and chemical libraries are much less diverse. Induced pluripotent stem cells offer the possibilities of solving supply issues. Some commercial entities now provide off-the-shelf fully differentiated adult cells reprogrammed from other tissues. Harvesting of the source cells is accomplished more easily and at no detriment to the patient. Examples include reprogrammed cardiomyocytes, neurons, and hepatocytes. An even greater advance toward testing that faithfully reflects human physiology may come from the use of three-dimensional (3D) biology in vitro. The past five years has seen an explosion of commercial products that conduct assays with aggregated cells, sometimes in co-culture, that resemble tissues. These technologies can be divided into two major categories: 1) microscale or nanoscale scaffolding or surface textures in labware to encourage the 3D construction of cellular material; 2) nonadherent surfaces or hanging-drop technologies to induce cells to self-aggregate into spheroids. A number of commercial products use hard, polymeric structures in labware as a scaffold to build 3D structures of cells. Examples of these include electrospun fibers or porous disc inserts. The arrangement of fibers and pores allows cells to remain close to nutrient sources, enabling the exchange of nutrients, waste material, and gases similar to that seen in vivo. Alternatively, scaffolds can be created from components of a more natural or biological origin, such as proteins commonly found in the in vivo extracellular matrix. These commonly include, but are not limited to, fibronectin, collagen, laminin, and gelatin. Biological scaffolds not only provide a matrix to which the cells can attach and reorganize into 3D structures, but more importantly, they provide the correct microenvironment of soluble growth factors, hormones, and other molecules with which cells interact in an in vivo environment, which can alter gene and protein expression. The other approach to 3D cellular structures is to induce cell self-aggregation into spheroids. This can be accomplished using labware with proprietary coatings to reduce adherence. These coatings have been applied to standard microplates or special labware, and can be created through photolithography techniques such that the labware is micropatterned. 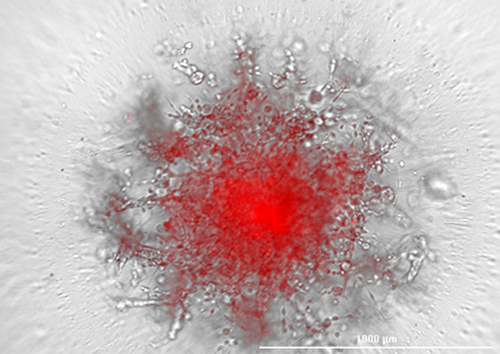 Both standard microplates or special labware can encourage the self-aggregation of cells into spheroids, although micropatterned labware offers the ability to analyze multiple spheroids in any given experiment. Alternatively, spheroids can be created in drops of media suspended from the bottom of labware. In hanging drops, there is no surface to which cells may adhere, so the cells naturally self-aggregate. The downside to this approach is that it is extremely difficult to perform assays in hanging drops of media. A transfer to labware in which assays can be performed is typically required. Whichever method is used for spheroid creation, it is evident that spheroids are widely used in the oncology therapeutic area in particular as the aggregated cells mimic tumors. Coincident with this rise in the use of more complex cellular models is a return to classical pharmacological approaches in drug discovery. With classical approaches, no hypothesis for drug target is required to start. Instead, a phenotype consistent with the disease is chosen as an assay readout for screening. It has been shown through statistics that a disproportionate number of first-in-class drugs with novel mechanisms of action have come from phenotypic screening over the years. An example of a phenotypic readout for assays using cardiomyocytes could be their beating rhythm. Often the detection technology of choice for phenotypic screening is fluorescence microscopy with its inherent capabilities for multiparametric analysis. In the future, we can expect to see further attempts to enhance the physiological relevance of in vitro assays by increasing the complexity of the cellular models used. There is great promise in using 3D printing to create whole organs such as heart, kidney, or liver. The principal application for these bioengineered organs is for patient transplants, but an added functionality is their use as complex models for drug screening. Bioengineered organs may prove to be the next best thing to testing in humans. Peter Banks, Ph.D. (BanksP@biotek.com), is the scientific director at BioTek Instruments.